Put ‘Copenhagen West’ and ‘natural beauty’ in the same sentence and you’ll baffle a lot of people. In large parts of Denmark, Copenhagen West is sometimes thought of as nothing but concrete and hassle. 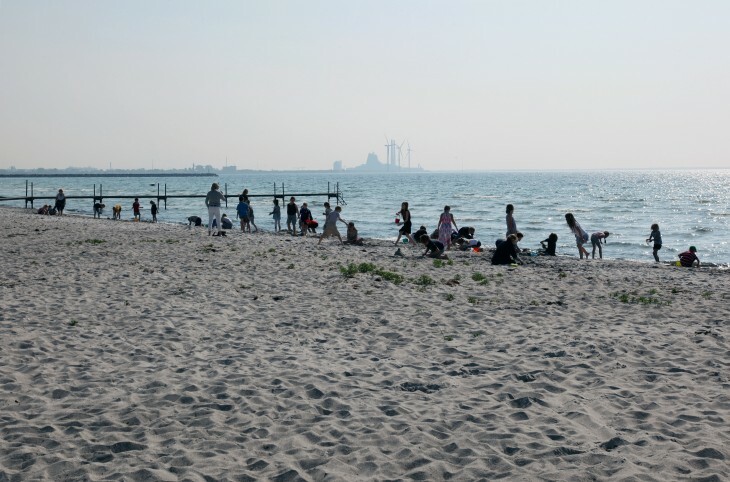 This is actually deeply unfair – Køge Bay boasts a wealth of natural sights and activities. On a warm, early summer’s morning, you are greeted by the scent of wild roses and flowering hawthorn combined with the tang of salty sea air. The lapwings are in a flap, chasing away crows, who are a little too fond of bird eggs for the lapwings’ taste. In the bushes, nightingales sing. In St. Vejle River, frogs croak. In the forest, cuckoos cuckoo. And in the river, trout and perch are jumping. Where the lagoons and reed beds end, the sandy beach begins. There are seven kilometres of it, created artificially by extending the original coastline. It’s reminiscent of a North Sea beach, and no wonder. When the beach was established in the late 1970s, 2.6 million small tufts of prickly sea-green grass were relocated from the West Coast to hold the dunes together. The beach park was an immediate success, and the beach itself is just a small part of the experience. There are almost endless opportunities for activities, and it’s clear that the locals have taken the water park to their hearts. They run, swim, kayak, walk dogs, sail, play games, barbecue, explore and cycle. Amid all the natural glory of the protected areas around Ishøj Beach is Arken Museum of Modern Art, one of Denmark’s very best art galleries. A rare opportunity to combine nature and culture. An app with a guide to things to see and do is available from the beach park’s website. The cycle and running path Vestegn Route is 42 km long and an official marathon route. It passes through all seven local authorities in Copenhagen West. 200 km of cycle paths bind the area together, and a cycle path runs along the coast all the way from Copenhagen to Køge. The inner bank in the current lagoons is the original shoreline. It consisted mostly of shallow water and reed beds. In the inter-war period, the plan was to create an artificial beach with fine sand farther out in the bay. However, the work didn’t get under way until the late 1970s, and the park wasn’t finally inaugurated until 1980. In the old days, it was said that if the lapwing built its nest high up on land, where it was dry, the summer would be wet. Conversely, it would be a dry summer if it nested on a damp meadow – so keep an eye out for lapwing nests. Very varied, with beach, shallow lagoons, reed beds, streams, lakes, meadows and woodland. Rich in birds and insects. Helleborine orchids grow in the in the woods at Ishøj Beach. The 190,000 trees that were planted when the beach park was first established are growing tall now. Many of the paths and facilities are wheelchair friendly. Bathing ramp for wheelchair users at Ishøj Beach. General stores and cafés in several places, good opportunities for barbecues and bonfires. Tables and benches for picnics..